A new way of enhancing the interactions between light and matter, developed by researchers at MIT and Israel’s Technion, could someday lead to more efficient solar cells that collect a wider range of light wavelengths, and new kinds of lasers and light-emitting diodes (LEDs) that could have fully tunable color emissions. The fundamental principle behind the new approach is a way to get the momentum of light particles, called photons, to more closely match that of electrons, which is normally many orders of magnitude greater. Because of the huge disparity in momentum, these particles usually interact very weakly; bringing their momenta closer together enables much greater control over their interactions, which could enable new kinds of basic research on these processes as well as a host of new applications, the researchers say. The new findings, based on a theoretical study, are being published today in the journal Nature Photonics in a paper by Yaniv Kurman of Technion (the Israel Institute of Technology, in Haifa); MIT graduate student Nicholas Rivera; MIT postdoc Thomas Christensen; John Joannopoulos, the Francis Wright Davis Professor of Physics at MIT; Marin Soljačić, professor of physics at MIT; Ido Kaminer, a professor of physics at Technion and former MIT postdoc; and Shai Tsesses and Meir Orenstein at Technion. While silicon is a hugely important substance as the basis for most present-day electronics, it is not well-suited for applications that involve light, such as LEDs and solar cells — even though it is currently the principal material used for solar cells despite its low efficiency, Kaminer says. Improving the interactions of light with an important electronics material such as silicon could be an important milestone toward integrating photonics — devices based on manipulation of light waves — with electronic semiconductor chips. One way to do that is by slowing down, or shrinking, the light enough to drastically lower the momentum of its individual photons, to get them closer to that of the electrons. In their theoretical study, the researchers showed that light could be slowed by a factor of a thousand by passing it through a kind of multilayered thin-film material overlaid with a layer of graphene. The layered material, made of gallium arsenide and indium gallium arsenide layers, alters the behavior of photons passing through it in a highly controllable way. This enables the researchers to control the frequency of emissions from the material by as much as 20 to 30 percent, says Kurman, who is the paper’s lead author. Because of that shrinkage, the light can then be absorbed by the semiconductor, or emitted by it, he says. 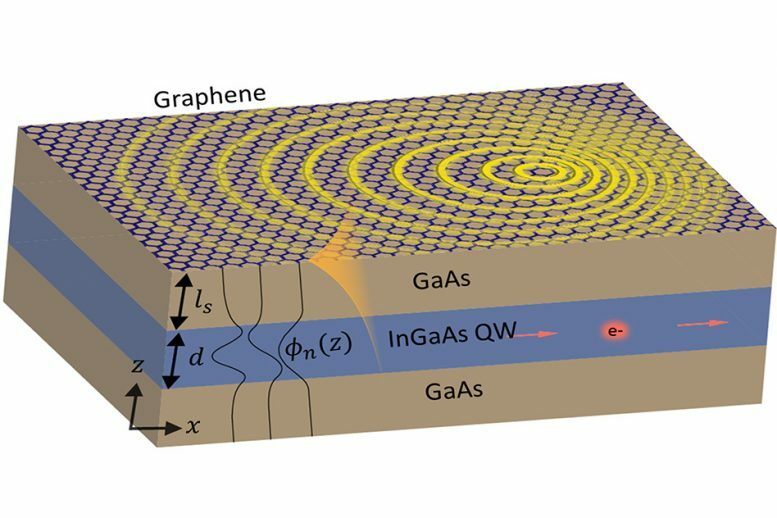 In the graphene-based material, these properties can actually be controlled directly by simply varying a voltage applied to the graphene layer. In that way, “we can totally control the properties of the light, not just measure it,” Kurman says. Although the work is still at an early and theoretical stage, the researchers say that in principle this approach could lead to new kinds of solar cells capable of absorbing a wider range of light wavelengths, which would make the devices more efficient at converting sunlight to electricity. It could also lead to light-producing devices, such as lasers and LEDs, that could be tuned electronically to produce a wide range of colors. “This has a measure of tunability that’s beyond what is currently available,” Kaminer says. “The work is very general,” Kurman says, so the results should apply to many more cases than the specific ones used in this study. “We could use several other semiconductor materials, and some other light-matter polaritons.” While this work was not done with silicon, it should be possible to apply the same principles to silicon-based devices, the team says. “By closing the momentum gap, we could introduce silicon into this world” of plasmon-based devices, Kurman says. The work was supported by MIT’s MISTI Israel program. Be the first to comment on "Engineers Enhance the Interactions Between Light and Matter"